The Media-Enhanced Learning Special Interest Group (MELSIG) has run one-day events across the UK since it was formed early in 2008. The 30 events held to date have all been oversubscribed. There is no charge to delegates to attend, though a charge of £20 is made for delegates who don’t turn up as we usually run a ‘wait list’ of people who want to attend. A good proportion of attendees have been to previous events and their interest and experience rub off as they network with colleagues at hosting institutions. The SIG operates in many ways and the events have consistently fed into other opportunities for scholarship and collaborative development for those who get involved. As might be expected, this means hosting institutions not only discover new champions of their own but see these people establish reputations nationally through the SIG. 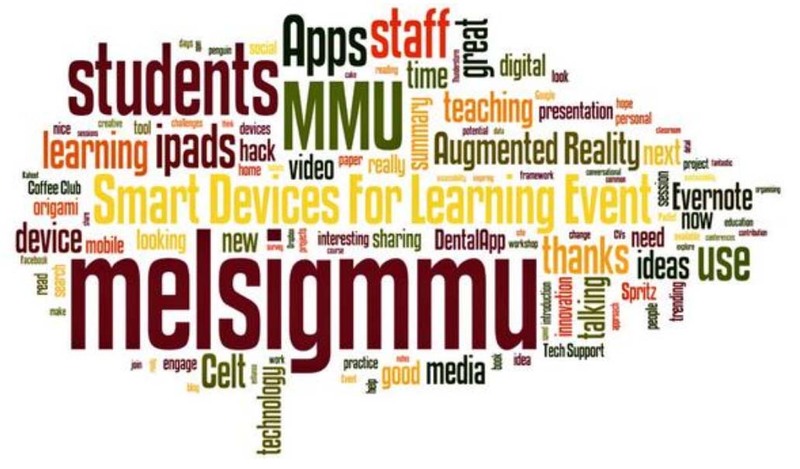 MELSIG involves staff at the host institution in leading-edge thinking about pedagogy, using media and technology, managing the use of media and technology, and current thinking about enhancing and transforming learner engagement through digital and social media. Events create a platform for academics from host institutions to find professional recognition by presenting their innovative practice and showing themselves as being capable academic leaders alongside peers from other institutions. The host institution becomes associated with innovation in the lead up to the event, but more importantly as a lasting outcome of the event. Events generate new thinking through presentations and workshops and this is recorded and then shared through the MELSIG site and other online networks. Events have notoriously also seeded many book chapters, academic papers, and other publications. Institutionally, Learning, Teaching & Assessment strategies, academic development and curriculum innovation initiatives receive external validation and an injection of critically considered ideas. The MELSIG Steering Group is made up of experienced educational developers. Its members not only understand media-enhanced learning, we understand the realities and intricacies of educational change and are able to take a holistic view of innovation. MELSIG events create an opportunity for academics, IT leaders, learning technologists, and educational developers to share their perspectives together in a common, externally facilitated context. The events help to establish common ground and we hope this fosters productive thinking as a legacy. We come to you! By hosting the event you are able to engage a large number of your staff in a common interest. This group then becomes a resource to the institution, networking either informally or formally. Ideally there is a 50:50 balance of internal and external delegates at events. MELSIG events conclude with a ’round robin review’ in which as many as 100 delegates are asked to share one different ‘take away’ idea from the day. If you listen to these recordings you will hear there really are 100 different rich ideas to be taken away! What does a MELSIG host need to do? Space: A lecture theatre from 9.30 to 12.30, then classrooms for three parallel sessions. We try to reconvene at the end of the day in either a lecture theatre or a large classroom. In some cases a PC lab can be useful depending on the special focus. Space is needed for refreshments too. Refreshments: for delegates on arrival, a buffet lunch, an afternoon coffee break. devise and run engaging workshops that have either a practical ‘hands-on’ nature or stimulate thinking towards curriculum innovation. Workshops on Challenges and Opportunities have been run at some events designed to engage stakeholders with diverse institutional roles and perspectives. Evaluate the event and report findings to the host. “I am a total novice to media enhanced learning and I felt that this event was an excellent way to learn about the potential for using various media to enhance learning and teaching in a HE context. The various sessions provided a good balance between the theory and practicalities of using various media. The morning sessions on video and giving audio feedback to students provided some really interesting case studies and food for thought. I would now feel more confident to introduce video into sessions and our team has already discussed the potential for our business advisers to provide audio feedback to their clients when preparing business plans etc. A rapid round robin review from delegates on what they will take away and talk to other colleagues about after the event.